Everyone in Koala Class had a great day today! All the children are getting used to doing our Morning Meeting, as well as having fun singing and dancing to songs we hear each day. Today we did our Children’s Day craft; making carp flags. After choosing what color paper they want, everyone used paint brushes to drip blue, red, and yellow paint on their papers to make cool designs. When we folded and opened them they looked great. After lunch, the children pretended to be different animals, including rabbits. The Easter Bunny made a final visit to teach us an Easter dance. 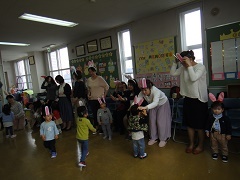 She also had rabbit ears for everyone to make and wear when we danced. 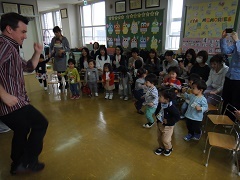 Many parents joined in and made it a very fun dance. See you next week!